Space based gamma ray observatories; sensors on aircraft and surface particle detectors observe fluxes of gamma rays, which are correlated with thunderstorms. In some, yet fully unknown circumstances electrons are accelerated upward in direction to space and downward in direction to the Earth and dramatically enhance usually rather stable cosmic ray background. These very important phenomena are now intensively researched both in space and on the Earth’s surface. Numerous particle detectors and field maters located on the slopes of mountain Aragats and in Yerevan 24 hours 12 months are monitoring changing geophysical conditions. 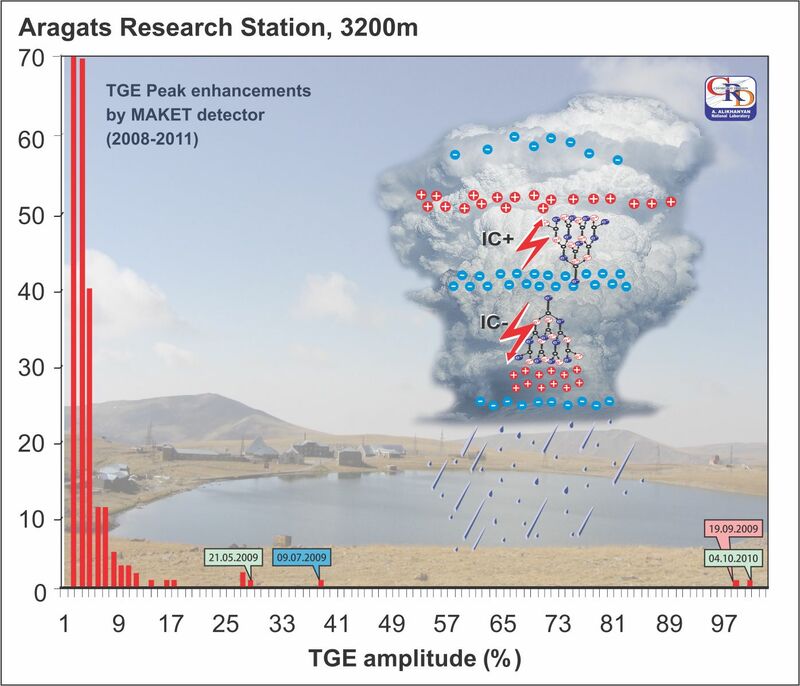 After analyzing near 300 detected at Aragats Thunderstorm ground enhancements (TGEs) we present the physical model of the new phenomena. Rapidly expanding field of energetic particle and radiation physics in the terrestrial atmosphere, namely, High-Energy Atmospheric Physics, impacts traditional atmospheric electricity and lightning physics, study of cosmic-ray extensive air showers, discharge physics, space physics, plasma physics, and aviation safety . One of the most exciting manifestations of the new field is so called Thunderstorm Ground Enhancement (TGE, ): about enhancements of surface particle detector count rates correlated with thunderstorm activity. Facilities of the Aragats Space Environment Center (ASEC, ) observe charged and neutral fluxes of secondary cosmic rays by the variety of particle detectors located in Yerevan and on slopes of Mount Aragats at altitudes 1000, 2000 and 3200 m. ASEC detectors measure particle fluxes with different energy thresholds as well as Extensive Air Shower (EAS) initiated by primary proton or stripped nuclei with energies greater than 50–100 TeV and Extensive Cloud Showers (ECS) initiated by the electron-gamma ray avalanches in the thunderstorm atmosphere. TGEs detected during 2008-2011 bring vast amounts (243 events) of small and very few large TGEs (only 6 TGE events with amplitude exceeding 20%) allowing the detailed analyses and taxonomy of the new high-energy phenomena in the atmosphere. In Fig. 1, we present the histogram of the 243 TGE amplitudes measured by the MAKET detector in 2008-2011; the dates of 4 largest TGE events are displayed as boxed text; flux enhancement is presented in percentage relative to rather stable background of the ambient population of secondary cosmic rays. 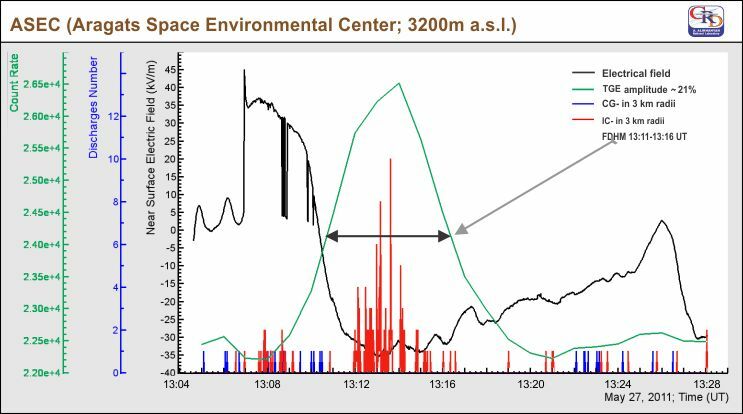 As we can see in the left corner of histogram of Fig. 1, majority of TGE events have amplitude less than 10 %. These mall TGEs and analogical TGEs reported by other groups can be explained by the modification of the energy spectra of charged particles in the electric field of thunderclouds. 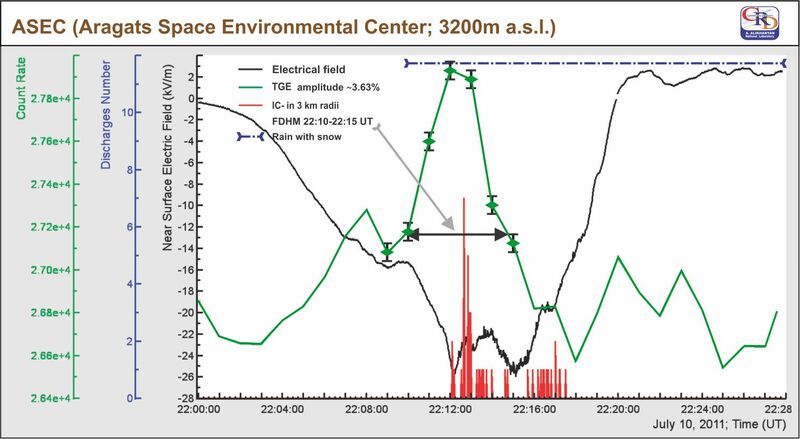 Due to asymmetry of positive-to-negative flux of secondary cosmic rays in the terrestrial atmosphere, peaks and dips can arise in time series of count rates of surface particle detectors. These effects have been theoretically analyzed in  and detected on Mount Norikura  and in Baksan, Russia . Measurements at ASEC and simulations with GEANT4 package  confirm additional flux of gamma rays up to 1000% in the energy range 2-20 MeV and up to 10% in the energy range up to 100 MeV. Simultaneously dips in the muon flux at energies above 200 MeV were obtained by GEANT4 simulations and detected by ASEC detectors. Figure 1. The histogram of the amplitudes of TGE events detected by ASEC detectors in 2008-2010. 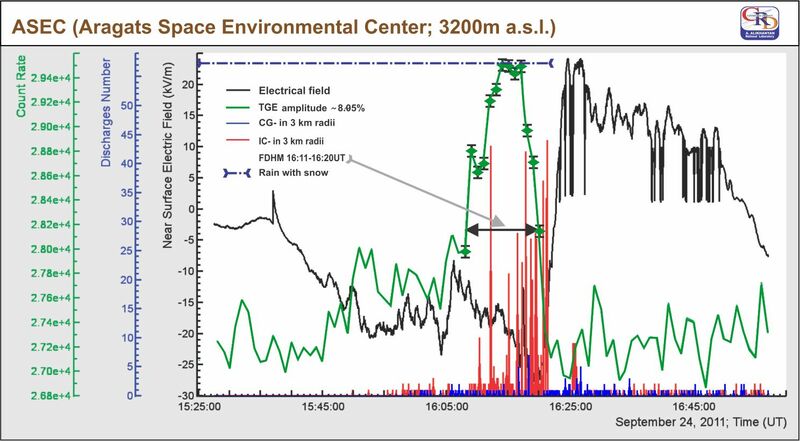 The peak values of the cosmic ray flux increase above rather stable secondary cosmic ray background were measured by the outdoor plastic scintillators. Few very large enhancements seen in the right corner of Fig. 1 can be explained only by invoking the Runaway Breakdown (RB) process , also referred as Relativistic Runaway Electron avalanche (RREA, [9-11]. The ambient population of secondary cosmic ray electrons in the electric fields with strength greater than critical value unleash the electron-gamma ray avalanches and total number of particles on the exit from the cloud can be multiplied by several orders of magnitude. Proceeding from the measurements of the charged and neutral fluxes as well as from the energy deposit of particles in thick scintillators we recover the energy spectra of TGE electrons and gamma rays for the 2 largest TGE events of September 19, 2009 and October 4, 2010 . Installed at Aragats field meters and lightning detectors allow correlating the measured particle fluxes with near-surface electric field disturbances and with occurrences of lightning of different types.Lightning occurrences, as well as sketch of the RREA process in upper and lower dipoles also are depicted in Fig.1. The indispensable condition of TGE initiation is the creation of the lower dipole accelerating electrons downward. The temporarily emerging Lower positive charge region (LPCR, ) is smaller than the mid-level negative and upper positive layers of the main upper thundercloud dipole . Therefore TGE phenomena is local and its duration coincides with the duration of the existence of LCPR, at Aragats usually ~10 minutes. Depletion of the cloud-ground lightning occurrences and enhancement of the intracloud lightning occurrences. Modification of CR energy spectra (MOS) process,which is responsible for the gamma ray and electron flux enhancements and depletion of highenergy muon flux. Electrical fields in thunderclouds effectively transfers field energy to electrons; electrons generate gamma rays and gamma rates by photonuclear reactions born neutrons detected on earth’s surface [16-18]; RREA can generate particle bursts with duration less than 50 microseconds  ; overall duration of TGE is ~ 10 minutes, during 10 minutes large amount of short bursts occurs; Largest TGE events allows to estimate energy spectra: energy spectra of electrons and low energy gamma rays are exponential; energy spectra of gamma rays above 10 MeV are described by power law in overall agreement with GEANТ4 simulation; TGEs usually occurred on negative near surface electrical field varied from -10 to -30 kV/m; During TGEs the fraction of IC- lightning occurrences is strictly increased, CG- lightnings are suppressed; observed behavior of lightning occurrences supports emergence of the LCPR and, consequently, lower dipole. The upper dipole accelerates electrons upward to the space where electrons, positrons and gamma rays are detected by space born gamma ray observatories . This founding is very important for geophysics, atmospheric physics and climatology. Ongoing climate change can lead to significant increase of lightning occurrences mostly in globe dry regions. Monitoring lightnings by worldwide networks of antennas and by space born monitors, planned in coming decade at International Space Station [21,22]will help to establish the forewarning services on disastrous weather conditions greatly enlarged recently. The increasing rate of lightnings and simultaneous increase of their height can alert on the upcoming huge thunderstorm with possible flooding. The increasing rate of positive cloud to ground lightnings is manifestation of possible hailing. Numerous particle detectors and field maters located on the slopes of mountain Aragats and in Yerevan 24 hours 12 months are monitoring changing geophysical conditions. Planned geophysical station near Sevan lake with existing 3 stations on slopes of Mt. Aragats will monitor particle fluxes from sun, thunderclouds and Galaxy as well as magnetic and electrical fields and lightning occurrences; issue alerts and forewarnings on upcoming dangerous consequences of space and thunder-storms. Dwyer J.R., Smith D.M., Cummer S.A., Space Sci Rev, DOI 10.1007/s11214-012-9894-0, 2012. Chilingarian, A., et al., Nucl. Inst. and Methods in Phys. Res. Sect A, 543, 483, 2005. Chilingarian, A., et al., Phys. Rev. D 82, 043009 (2010). Dorman, L.I., et al., Advances in Space Research 35, 476-483, 2005. Muraki, Y., et al., Phys. Rev. D 69, 123010, 2004. Alexeenko, V. V., et al., Phys. Lett. A, 301, 299–306, 2002. Agostinelli, S., et al. Nucl. Instrum. Methods Phys.Res., Sect. A, 506(3), 250–303, 2003. Gurevich, A. V., et al., Phys. Lett. A, 165, 463,1992. Babich, L. P., et al, Phys. Lett. A, 245, 460–470,1998. Dwyer J.R., Geophys. Res. Lett., 30(20), 2055,2003. Carlson, B. E., Lehtinen, N. G., Inan, U. S., J.Geophys. Res.Lett. 34, L08809, 2008. Qie, X., et al., Geophys. Res. Lett., 32, L05814,2005. Williams, E.R., J.Geophys.Res., 94, 13151-13167,1989. Torii, T., et al., J. Geophys. Res. 107, 4324, 2002. Chilingarian, et al., Phys.Rev.D 85, 085017,(2012). Gurevich, A.V. et al., PRL 108, 125001, (2012). Tsuchiya, H. et al., arX:1204.2578v1 [physics.geoph],Phys. Rev. D accepted, (2012). Chilingarian, A. et al., Phys. Rev. D 83, 062001(2011). G.J. Fishman et al., Science 264, 1313 (1994). V. Kuznetsov, Y. Ružín, V.M. Sinelnikov, Kosm. Nauka Teh. 17, 12 (2011). TGE of the first type according to pattern if the electric field disturbanse: the black curve shows changing electric field; red lines-IC-lightnings and blue CG-lightnings occurences within 3 km radius; the green curve shows the time series of the particale flux minutly counts. Particale fluxs peaked at 3.36% above CR background. TGE of the first type according to pattern if the electric field disturbanse: the black curve shows changing electric field; red lines-IC-lightnings and blue CG-lightnings occurences within 3 km radius; the green curve shows the time series of the particale flux minutly counts. Particale fluxs peaked at 8.05% above CR background. TGE of the first type according to pattern if the electric field disturbanse: the black curve shows changing electric field; red lines-IC-lightnings and blue CG-lightnings occurences within 3 km radius; the green curve shows the time series of the particale flux minutly counts. Particale fluxs peaked at 21 % above CR background.